Toast the slices of bread in a toaster or toaster oven. 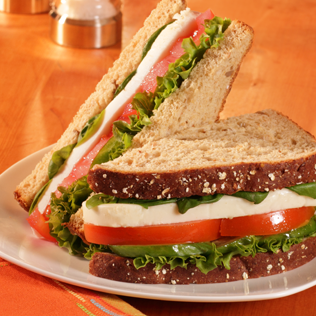 Spread pesto mayo on to half of the toast – this will act as the top half of each sandwich. 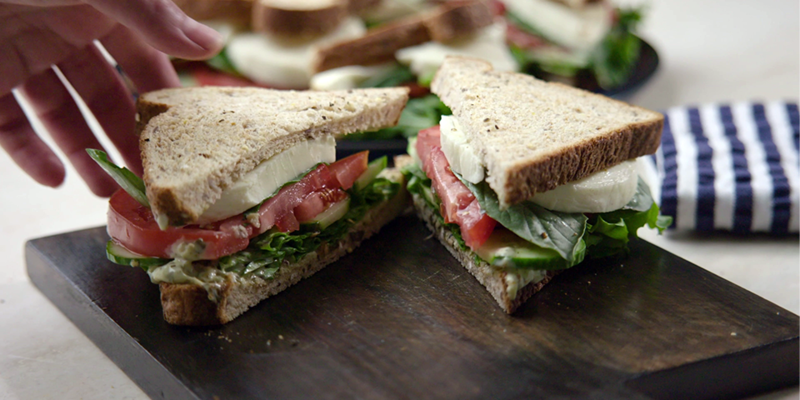 On to each sandwich, layer lettuce, cucumber, tomato, 4 basil leaves, and sliced Fresh Mozzarella. Sprinkle with salt and pepper, and top with second slice of toast. 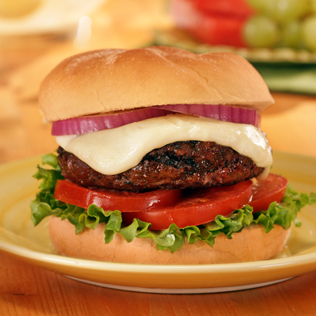 Other layering options may be sliced avocado, sliced red onions, alfalfa sprouts, field greens, or fresh spinach. TIP: Mix up your mayo! Roasted red pepper mayo: Pat dry 1 large jarred roasted red pepper. Pulse in food processor until smooth. Add 80mL (⅓ cup) mayonnaise and process until combined. Fresh herbed mayo: In food processor, pulse together 5g (¼ cup) each parsley leaves and basil leaves until finely chopped. Add 125mL (½ cup) mayonnaise and process until combined. 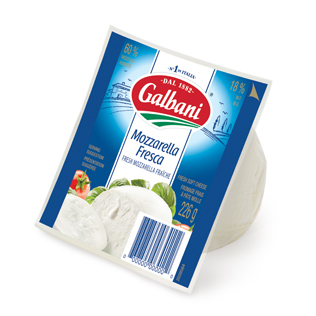 Perfect for both hot and cold sandwiches as well as for pizza and antipasti platters.